Passengers traveling in and out of Battersea's well known railway station, Clapham Junction, have been reporting news back to us of a Specsavers poster claiming that its "Clapham" store is only 2 minutes away - this is clearly wrong as Clapham is over a mile away from Clapham Junction station (approximately 1.2 miles to be precise, roughly 2 kilometres). So, we asked ourselves what's going on here. 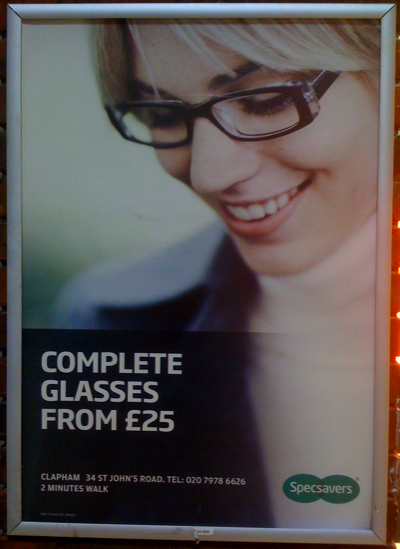 Surely Specsavers weren't looking through a lens darkly? Ah ha, you might say - they've fallen into the Clapham-trap and clearly need a new pair of Battersea glasses so that they can look around and see that their St. John's Road store is slap bang in the Heart of Battersea. Specsavers are wearing corporate bi-focal lens and its causing them to see themselves in two different places over a mile apart at the very same time! 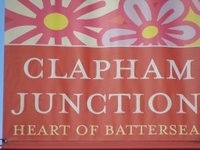 Their address is in Clapham (Lambeth) but their store is in Clapham Junction (Battersea). The SW11tch Back to Battersea Campaign team has written to the store's Directors Maggie Thorpe-Kerr and Neil Bryant to invite them to see better and join the Battersea family, thereby specsaving any further confusion. The best thing that people can do is have an address with Battersea in it - that way people will always know where you are. As ever, we'll be keeping Battersea updated on the latest news and what response Specsavers provide. We hope very much that they will be pleased to support our campaign and Back Battersea.